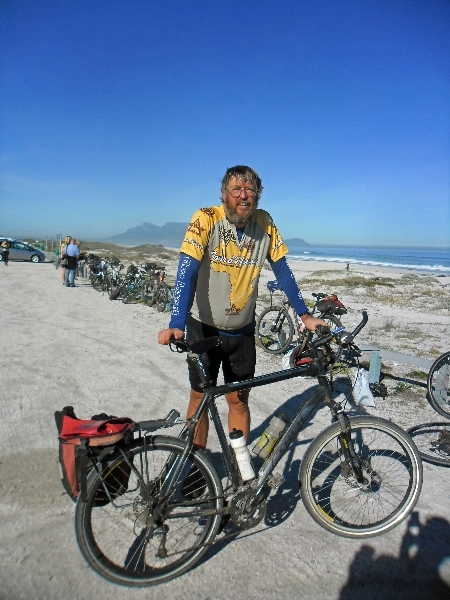 This site describes a cycle ride across Africa including preparation leading up to it and a following trip taken just afterwards. Last Africa posts – click on “BLOG” for other Africa posts. Last USA posts (for trip taken just after TDA) – click on “EPILOGUE” for other USA posts. Blog provides latest updates for Africa. Equipment is my and others equipment lists. Map is map of the route. Photos are my and other pictures. Weather are weather forecasts for African cities. Countries is a list of blog posts by country. Sections is a list of blog posts by TDA section. Other Blogs is an aggregation of recent blog posts from others on the trip. Twitter is a list of tweets using hashtag #tda2013. Hey Mike, i’d just like to say how much I like your website! It’s just brilliant to have so much information about the TDA (past and present) at a touch of a button. I think I will be back quite a lot to check on everyone’s progress before I get everything sorted. Thanks Philip. I’ve made links to your web site as well as on the “Other blogs” section. I enjoy your postings and seeing variety of different perspectives as we get ready for the trip. thanks for your perfect website! An important help to follow your way through Africa. My friend Reinhard and me, we are watching you and the group of TdA excitedly. We are especially interested in the way our common friend Kurt Schwietzke will manage his tour. Perhaps you got to know him by now as one of your mates on your African ride. Please say hello to him from his friends. And we keep our fingers crossed. Thank you for your help. Wishing you all the best for this tour. Thank you, I will give Kurt a hello. Hi Mike, thanks for the great blog. Our son Jared is riding and so this is great to read different perspectives of the adventures all of you go through. I have also enjoyed the links to the previous years blogs that give us an insight as to what is ahead for you. We are excited for the whole team and wish you safety, good health and overall a fun adventure. Jared always has a big smile on his face, I think he is having fun. I did search on the internet for an itinerary for the TDA 2013; the web you have is well planned. Good job! I wish you all to be safe and to have an amazing time in this journey. Thank you. Catalin was lifesaver with my bike wheel. Sometimes a bit of a circus to travel with so many, but well organized and think both staff and riders are having fun. Good to see you having fun. You are one of the few people I know who is able to do this at regular intervals. Keep it going. wir haben aus gut informierten Quellen von diesem Event gehört und dachten, da sollte auch mal ein deutschsprachiger Eintrag erfolgen! Euch weiterhin alles Gute, viel Erfolg und wenig Defekte. Greetings from the past, Mev! On a whim, I checked out your latest bike-meanderings. Great to see that you’re still rolling! May the wind be at your back. Thanks Rick – looks like from news New England is getting slammed with a huge storm, stay warm (something we don’t need more of here). I am Anne Cook Mother and would like to say hello and tell how much I enjoy reading you experiences.Please say Hello to Anne for me! I always look everyday to get the latest news.I hope to hear from Anne also!Greetings from Brenda. Will send greetings. Anne is a very determined rider and admire her persistence. Will pass along greetings to Alex. Saturday and I am home with Jack fast asleep on the mat.Good when I can find yuor stories on the pooter.Not always easy though! !Keep up with Blanche.With some Dutch Courage from home from ytour parents you will be alright.Love Mum. Ha die neef, mooi om een verslag van de verkiezing te lezen. Maakte mij al ongerust hoe jullie dat gingen doen. Vorige verkiezing en afloop staat nog vers in mijn geheugen. We are in good spot to adjust if necessary. There is a lot of caution with election commission and media because of 2007 election. However with half the ballots counted, signs continue to be positive that we won’t see a repeat of 2007. Greetings Mev, nice to see the blog and details. Have fun. Thank you. Hope all is well with you. Congratulations on finishing, an amazing achievement. I followed your blog all the way along – was always looking forward to postings when you could make them. Thanks so much for sharing, I enjoyed it immensely. It has inspired me to finally actually sign up for next years TdA. Did you feel the tour was worth the cost ? And in what ways was it great ? Am thinking of this for 2015 when it returns to Cairo. The cost was worth it to me. In particular, this is the type of trip I would do once in life. I’ve done a lot of my own other trips (at lower average cost per day) but crossing Africa requires for me some extra support compared to what I can do on my own in North America or Europe.